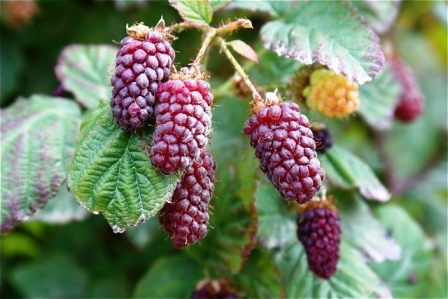 Tayberry was evolved at the Scottish Crops Research Institute, Inver Gowrie, Scotland, by crossing loganberry (which is itself a cross between Aughinbaugh’ blackberry and red raspberry) and black raspberry. The crosses were made by two fruit breeders Dr. Derek Jennings and Dr. David Mason of this institute in 1976. The name “Tayberry” was given after the river Tay flowing in Scotland. It was patented in 1979. Tayberry fruits are sweeter as well as more aromatic than its parents. A medium shrub, canes about 2 m long, prickly, laterals short. Fruits conical, 2.5 to 4 cm long, reddish purple at ripening. Most morphological features are like those of blackberry. The fruits are good to eat and are more delicious than its parents. These are eaten raw and also made into many products like jams, jellies, pie etc. Tayberry juice makes a refreshing drink. A very good wine is also made from tayberry fruits. Tayberry is a very healthful fruit. It is low in calories and rich in fibre. It is also a good source of antioxidants. 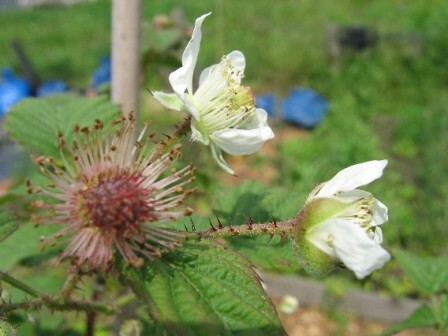 Though tayberry bears fruits which are better than not only its parents, its parents but many of its relatives in the genus Rubus, its cultivation as an orchard fruit has not been able to pick up. The reason for this is that hand picking of tayberry is not easy because of the prickles. Machine harvesting is also not feasible. 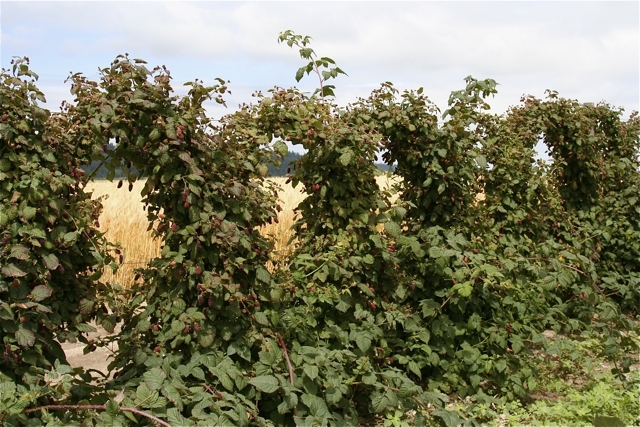 Therefore fruit growers avaoid planting this bramble in their fruit orchards though it is a quite productive fruit and yield upto 12 tons per hectare is possible. So tayberry is mostly grown as a backyard fruit. 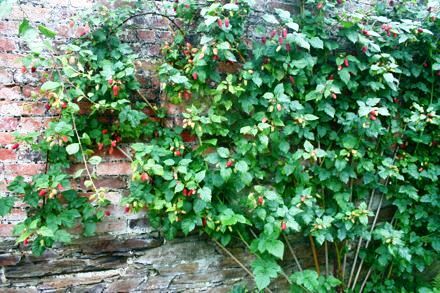 However, taybeery is a fairly adaptive plant and will grow on a variety of soils. It is also a fairly cold hardy plant and can withstand temperatures upto -15 C. It is also resistant to most diseases including yellow rust. New plants can be raised by planting canes in mid-October.